As summer winds down and fall brings the coolness that prepares us for those cold wintry days, it is time to start thinking about winterizing your boat. 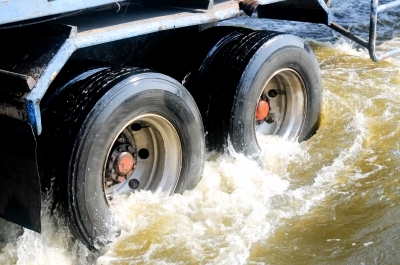 There are a few steps and tips on how to ensure your preferred vehicle for water transportation is sealed up, stowed away, and in perfect shape to patiently await its reemergence next summer. According to Discover Boating, the best place for your boat to be during the winter is out of the water, under some sort of cover and in a climate-controlled boat storage area. However, this tends to be a fairly expensive process. An alternative to this is wrapping your boat. This method can also be a bit expensive, but provides a very protective cover. If you choose not to follow either of these methods, just be sure that your boat is well covered with something sturdy such as a tarp. The first thing you should do when winterizing your boat is to make a checklist of all of the things you need to take care of before you leave your boat for the season. A great resource for this is your boats owner’s manual. The manual should include the specific recommendations of your particular model on how to winterize your boat. There are many things you may not consider or may not know about winterizing your boat. Each part of the boat must be carefully considered and checked before you finalize your winterizing. Check the inboard engines. Run the engine to warm it up. Once it’s warm change the oil. This will help the oil to drain faster and fuller. Also apply cooling water to the engine through the flushing port. You should run the engine to warm it up and change the oil while it is warm. This lets the oil to drain more efficiently. Also, make sure you supply water to the engine via the flushing port in order to cool it down. Remove the oil filter and refill the engine. Check the engine level and also check the engine for any possible leaks. Thoroughly inspect the stern drive. Remove any plants, barnacles, or anything else you may find from the lower unit of the drive. Also drain the gear case and check for moisture in the oil. If there is moisture in the oil this could indicate leaking seals that you must repair before spring. Lower units from the drive should be cleaned with soap and water. All fittings should be greased and their fluid levels should be checked. For all out of water storage there are a few things that you should definitely consider doing before you store your boat. Washing the hull is very important. Clean the barnacles off the props and shafts, rudders, struts and trim tabs. Open all the seacocks and allow any remaining water to drain. Make sure you check the hull for blisters, and if you find any make note and get them taken care of as soon as possible. This is also the perfect time to give the hull a good wax job. Now that you are aware or at least reminded of all of the basic necessities that come from winterizing a boat, try and get started on preparing for the process. Read your owner’s manual and start gathering supplies that you may need for cleaning and repairing parts. This may seem like a lot, but it is important to remember that thorough winterizing makes for a reliving, fun filled summertime on your well taken care of boat.